Myar Aranath takes place on the Continent of Myar and is a Total Conversion mod of "The Elder Scrolls III: Morrowind". It does not take place in or have anything to do with the "The Elder Scrolls" universe. 8 Basic Differences from "TES 3: Morrowind"
Myar Aranath was released in October 2005 and updated to final version 1.3 in 2006. Myar Aranath plays in the world Vyn, where the three other published Total Conversions of SureAI, Arktwend - The Forgotten Realm, Nehrim - On the Edge of Fate and Enderal - The Shards of Order also take place. Myar is west of Melee. The main Quest of Myar Aranath is about a magician named Zoras who tries to defeat humans with a demon army and lead the Dark Elves to power. The player joins an organization whose goal is to defeat Zoras and the dark elves. It soon turns out that Zoras is the father of the player. In the capital Ertorath you can join the guild Lightbringer. You can also join the Order. These two guilds are the only two factions the player can join. In total, you can enter ten cities and castles next to Fort Teras where the game begins. 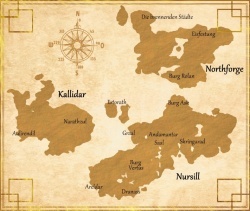 Castle Rolan is located on Northforge, and Aulirendil on Kallidar. Nursill, on the other hand, has Graal, Castle Ask, Hall, Areldar, the Castle Vertus, Dranass, Andamantar and Ertorath. There are 3 playable races. The Dark Elves, the Halfpaw, and the people of Myar. Basic Differences from "TES 3: Morrowind"
Myar Aranath is about half the size of "TES 3: Morrowind" but has a living environment including Deer, Birds, falling leaves and more. There are no official system requirements for Myar Aranath, but a slightly better PC system is recommended than for the original game "TES 3: Morrowind". This page was last modified on 30 November 2017, at 00:57.